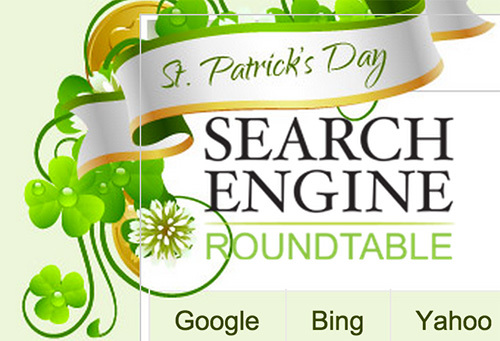 Today on the Google home page is an annual Google Doodle for St. Patrick's Day. This year, Google has an animated version of the Doodle. The Google logo has Three Leaf Shamrocks dancing, singing and playing music to celebrate the holiday. The animated Google Doodle was contributed by Eamonn O'Neill, a Irish director and designer. You can see his work on his site at eamonnoneill.ie. We have covered the past several years of logos for St. Patrick's day here and here is 2014, 2013, 2012, 2011, 2010, 2009, 2008, 2007, 2006, 2005 and 2004. You can learn a little bit more about the Doodle over here.